Bodrunov S.D. The Coming of New Industrial Society: Reloaded. Saint-Petersburg, INID n.a. S.Y. Vitte publ., 2016, 358 p.
The monograph presents the results of many years of reflection, research and analytical work performed under the aegis of the Institute of New Industrial Development n.a. S.Y. Vitte, where the author serves as the Director. He sees deindustrialisation that has encompassed Russia as ultimately destructive and believes that without a fundamental industrial core modern economy cannot develop normally and satisfy the ever¬growing wants. According to S.D. Bodrunov, the method of production determines the type of the economy and social order in general. 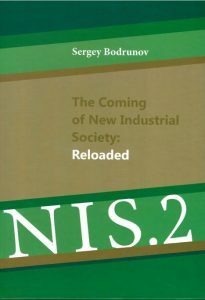 Specifically, industrial production that is currently undergoing a qualitative revival is bound to cause major changes in the social and economic system of the future that the author labels “the new industrial society”, or the NIS.2. New technological challenges support his claim and underlie the idea of the reindustrialisation of Russia on the most advanced technological basis reliant predominantly on knowledge intensive material production anchored in the integration of production, science and education that would serve as the foundation of such social order. The monograph discusses the conditions and ways of achieving this goal.